Tucker was hired as a planner in 1973. At the time, there were around 42,300 people living in Albemarle according to U.S. census data. As he nears retirement, the county population has more than doubled to a current estimate of 96,942. Tucker was charged with determining whether the assumptions made in the 1971 comprehensive plan were realistic. That document had been developed during a time when the county was experiencing double-digit growth rates due to a growth spurt at UVa. In 1976, Tucker succeeded his boss, former planning director John Humphrey. ↑ Shulleeta, Brandon. 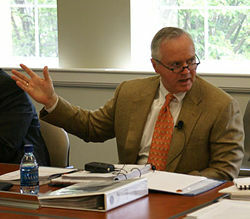 "Albemarle's Leader Will Retire Dec. 31 | Daily Progress." Home | Daily Progress. 27 Aug. 2010. Web. 27 Aug. 2010. <http://www2.dailyprogress.com/news/2010/aug/26/county-executive-announces-retirement-ar-474282/>. This page was last edited on 24 March 2012, at 19:40.